So, what is Xotic Eyes? This company was created by the artist Shannon Maxey, who created line of wearable art. You may have seen these products in Halloween Stores, Spencers and other creative stores. What makes this product different from others is that it has a strong bond that allows for it to stick to the skin and also allows for it to be waterproof and sweatproof. Many businesses has ordered these for clients, dance and cheer teams, party stores and many more to follow soon as this trend is catching on with each passing minute! They are also hoping to go bigger with selling to bigger franchises. I had an interview with this fabulous company earlier this week and I am hoping that I will be able to join this awesome family soon after I graduate from Rudy & Kelly Paul Mitchell Academy. I was so inspired while sitting in a room full of glitter, makeup, accessories, blinged out bras and sky high boots, wigs, headpeices, I just knew that I had to share this with my readers and how awesome this is. Many celebrities have been rockin Xotic Eyes, and it is spreading like wild fire across the nation and even internationally and it is all coming to you from my home town, good ol' Virginia Beach. 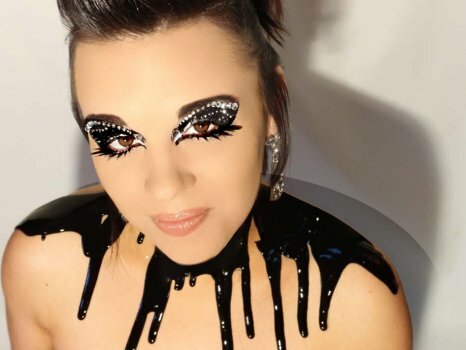 This goes out to all the artists, MUA's, hairstylists, and anyone crazy or creative who want to add some sprakle and drama, check out Xotic Eyes! You wont be dispappointed. "Never give up. There is no such thing as an ending, just a new beginning."